Note: (The Sacristan will do this, but remember you must always check to make sure each item listed below has been done). Fill one cruet with water and fill part of the pitcher with wine. Put the wine pitcher, and one ciboriurn with hosts on the small table in the middle of the church. Place the following on the Credence table by the sacristy door, cruet with water, bowl, finger towel, bells, chalice (with paten, pall, corporal, purificator and tabernacle key), and the rest of the empty ciboriums, as many as needed for the Mass. Put the Sacramentary where Altar Servers sit. The Lectionary will be carried into Church by the lector/Deacon. Light the candles about 3-5 minutes before Mass begins. Entrance - is made from the rear of the church. (1) Altar server carries the Cross, and (2) altar servers carry candles. The cross- bearer leads the procession. When carrying the cross keep it up high and straight. The cross should not weave back and forth as you are walking. Make sure the corpus (figure of Christ) is facing outward. When you arrive at the Altar do not genuflect, bow and then put the cross in its stand by the Ambo and stand in front of your seat. The candle bearers bow at the Altar, then put candles by the Sacristy door, and stand in front of your seats. Greeting - Done by the celebrant. Gloria - Remain standing and recite it. Usually, the Priest will nod his head for you to bring the book, but if he doesn’t, bring it to him when he says, “Let us pray”. Remember every time you pass the Altar, you must stop, face the Altar, bow, and then proceed. First Reading - Read by the lector, usually from the Old Testament. Responsorial Psalm - Usually led by the cantor but may be recited. It is never omitted. Gospel - Altar Servers pick up their candles, and stand on each side of the priest. Remember to face the same direction as the Priest. Bow with the priest. Altar server closes to the Ambo walks to the far side of the Ambo and turns toward the Ambo, Priest stands at Ambo, remaining altar server faces the Ambo and stands directly across from other altar server. Any altar servers remaining should stand and face the priest while he reads the gospel. Homily - (Explains the gospel scriptures) done by a Priest or Deacon. Altar servers sit during the homily. General Intercessions - Prayers of the Faithful read by a Lector, deacon or priest. Preparation of the Gifts - This was once called the offertory. Listed below is what altar servers do during the preparation of the gifts. While the ushers are collecting the offerings, (1) altar server puts the Sacramentary on the altar. Another altar server places the chalice with the pall, paten, corporal and purilicator on the altar. The Cross-bearer altar server takes the cross to meet the people carrying gifts to the altar. Altar servers left on the altar joins the priest at the bottom step to receive the gifts. One server shall stand on each side of the priest. The priest will give each server the wine and hosts that arc then placed on the altar by the servers. (1) Altar server brings the cruet of water to the priest; remember to face the handle toward the priest. The altar server returns to the credence table with the cruet and gets the bowl while another server picks the towel. The two altar servers return to the priest so he can wash dry his hands. Then return items to the credence table. The priest consecrates the host and wine, changing them into the body and blood of Christ. After he says, “This is my Body which will be given up for you”, and he raises the host, (1) altar server rings the bells. Then the priest raises his chalice and says, “This is my blood which will be given up for you” and another altar server rings the bells again. After each time the bells are rung all altar servers bow. The Great Amen - sung or said by everyone. Our Father - Altar Servers join the Priest by joining hands and everyone says the Our Father. After the Our Father is finished and everyone does the sign of peace by shaking hands the Cross-bearer picks up the cross and walks to the center of the church to meet the people and then leads them back to the altar. While the cross-bearer is bringing up the people the altar servers left bring up the remaining ciboriurns and cups and place them on the altar in their proper places. Remember the sacramentary must be placed on the altar if it is not already there. Communion —Altar Servers return to stand in Front of their seats and wait to receive communion with the Eucharistic Ministers. Everyone remains standing until Communion is over. 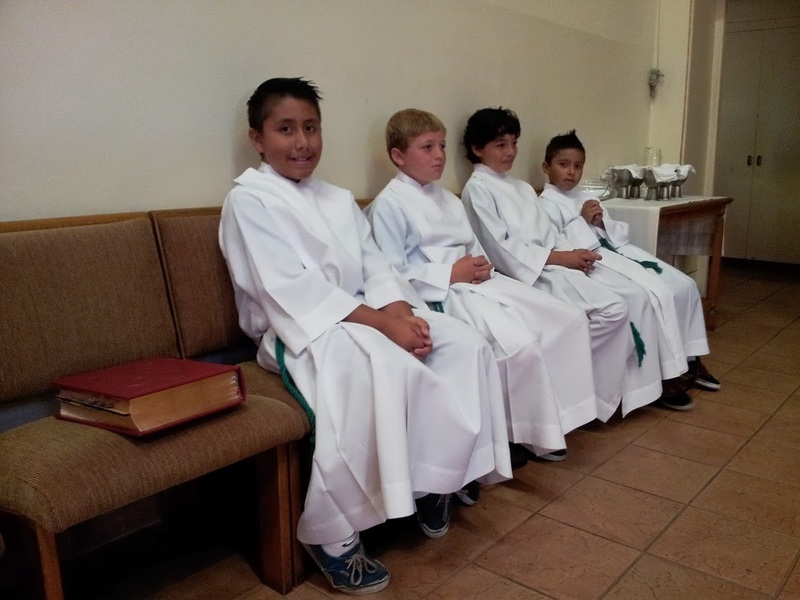 Altar servers sit down after Communion and wait until the Priest finishes cleaning of the altar. Items are placed on the corner of the altar then the priest returns to his seat. While the priest returns to his seat all altar servers rise and remove everything off the altar and return them to the credence table. Don’t forget to put the sacramentary where the altar servers sit. This book is used again for the closing prayer. Announcements - are made now by the priest. Final blessing - The priest will say “Let us Pray” cross-bearer altar server brings the book up the same way as at the beginning of Mass. Dismissal — Priest will stand before the Altar. Altar Servers pick up the cross and candles and go down to the bottom step and stand in front of the altar the same directions as the priest. All scrvers bow with the priest and turn the same direction as he does and then proceed out of the church. Remember to carry the cross high and straight. As soon as you leave the church blow out your candles and return them to the Sacristy. Bring all items from the credence table into the sacristy. Make sure all trash is picked up on the altar as well as in the sacristy, remove your robes, and HANG THEM UP. Make sure you have signed in. After this is done then you may leave the Sacristy. Always be neat and clean. Wear pants or skirt, which would be acceptable for school. Wear dressy shoes NO SANDALS. Please do not wear makeup, it gets on the robes and is very hard to get clean. Sitting/standing — make sure your body is erect and your posture straight; don’t slouch. Your hands should always be folded in your lap when they are not in use. Silence — Except when making the proper responses, you will be silent at all times. You do not want to distract the priest or the congregation by whispering to other servers. Silence is an essential part of the liturgy. At the penitential rite and after the invitation to pray at the prayers, you should join your thoughts to the priest’s in silence. Participate — in the Mass by saying all the congregations’ responses and prayers. No “Visiting” or laughing during Mass. Remember to help each other, this can be done quietly and most times with gestures. Fill one cruet with water and fill part of the pitcher with wine. Put the wine pitcher, and ciborium with hosts on the Credence table by the sacristy door. Also placed on the credence table are the bells, linger towel, chalice (with paten, pall, corporal, purifIcator and tabernacle key), and the rest of the ciboriums and glasses needed for the Mass. Put the sacramentaty on the altar. Light the large candles already on the altar about 3-5 minutes before mass begins. Entrance - is made from the sacristy into the church. Altar Servers walk in, in single file. The Priest follows. Everyone goes to the front of the altar and bows or genuflects. (Note: Be sure you ask the Priest before Mass starts as to which one he will do). You are to stand on each side of the priest and bow/genuflect altogether, then go stand in front of your seat. Opening Prayer - The Priest reads it from the Sacramentary on the altar. First Reading - Read by lector, usually from the Old Testament. Gospel - The priest stands and walks over to the Ambo. Altar servers stand and face the priest. homily - Done by a Priest or Deacon, explaining the scriptures. Altar servers sit during the homily. Preparation of the Gifts — Listed below is what altar servers do during the preparation of the gifts. Altar servers bring to the altar the chalice with the pall, paten, corporal, hosts, and pitcher of wine. (1) Altar server brings the cruet of water to the priest. Remember to face the handle toward the priest. The altar server returns to the credence table with the cruet and gets the bowl while another server picks up the towel. The two altar servers return to the priest so he can wash/dry his hands. Then return items to the credence table. Eucharistic Prayer — The priest consecrates the host and wine, changing them into the Body and Blood of Christ. After he says, “This is my Body which will be given up for you”, and as he raises the host (1) altar server rings the bell. Priest kneels at this time, altar server bows. Then the priest says again “This is my Blood which will be given up for you”, and raises his Chalice, Another altar server rings the bell again. Priest kneels and altar servers how. The Great Amen — sung or said by everyone. Our Father — Altar servers and Priest join hands during the Our Father. After it is finished the servers are to bring up all ciboriums and glasses left on the credence table and put them on the altar in their proper places. Remember the sacramentary must he placed on the altar if it is not already there. Communion — Altar servers return to stand in front of their seats and wait to receive communion with the Eucharistic Ministers. Remain standing until communion is. After Communion (1) altar server brings the cruet with water to the priest who pours some into his chalice so he can clean it. Altar servers sit down after Communion and wait until the Priest finishes cleaning vessels at the altar. Items are placed on the corner of the altar then the priest returns to his seat. While the priest returns to his seat all altar servers rise and remove everything off the altar and return them to the credence table. Don’t forget to leave the sacramentary on the altar. This book is used again by the priest for the closing prayer. Announcements - May be made by the Priest. 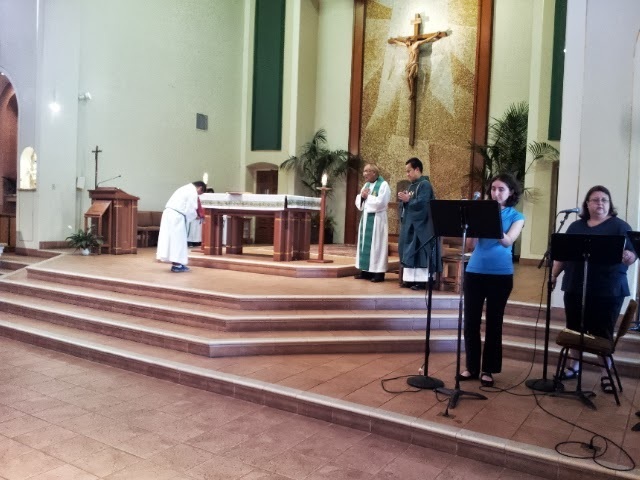 Final Blessing - Altar Servers remain standing. Dismissal - Priest will stand before the Altar, Altar Servers join the priest one on each side of him. All bow or genuflect together and then exit Altar thru the Sacristy door. Everything is done the same as at the Sunday mass, except the candles on the altar need to be put out. Special Note: The terms relating to having dinner used to explain what to do when serving a mass are to help the servers understand the order of the Mass. If you keep in mind when you ask people over to your house for a party you ask them into your home, you socialize with them, you get ready to have dinner and then you eat, then all guests go home it should help you remember the order in which to bring the priest what he needs for to complete the Mass you are serving.